Evan Luckes is a nurse in the Emergency Department at the Royal London Hospital in Whitechapel. Following Wednesday’s protest by Docs Not Cops against immigration checks in the NHS, he explains why they’re calling for a national campaign of non-compliance. 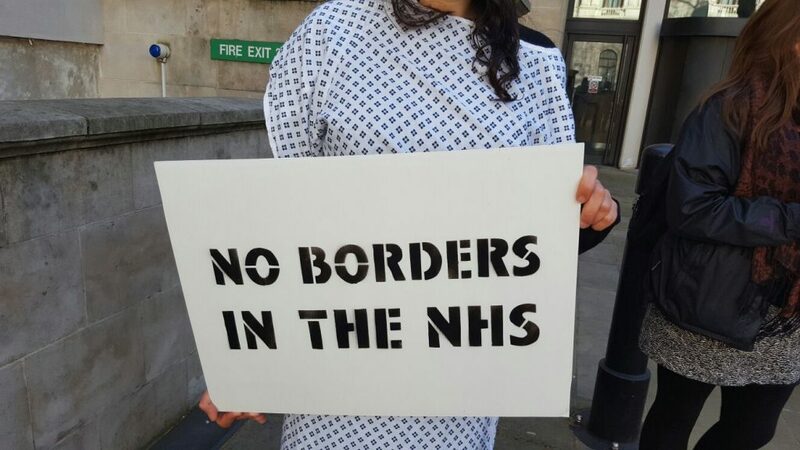 On Wednesday Docs Not Cops organised a #PatientsNotPassports day of action. We erected a temporary border control checkpoint in front of the Department of Health in protest at the changes. 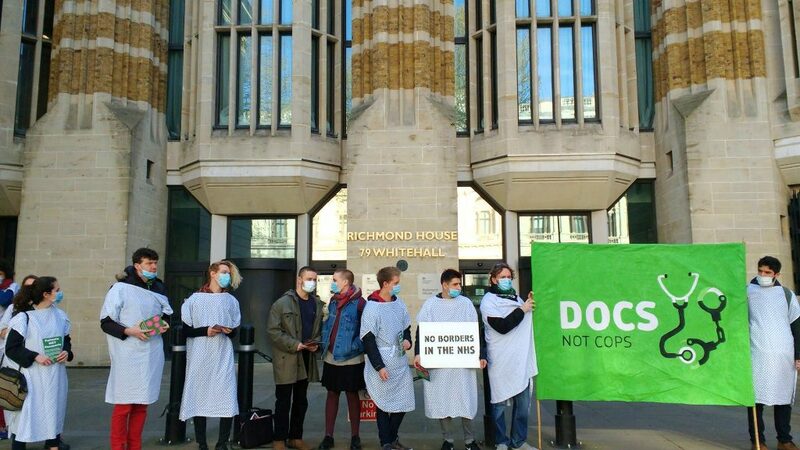 Docs Not Cops is a campaign group formed of NHS workers and patients. We believe no one should be afraid to access the healthcare they need, either because they can’t pay or might be punished, and that NHS workers should not police the people they treat. As a nurse I can’t imagine the damage that would be done if I were forced to police my patients immigration status. The relationship I have with my patients relies on trust, trust that I won’t judge them, that I will do the best for them and be their advocate in a system that is complex and inaccessible. Instead people will now approach me with fear and trepidation as I will come to represent a threat to both their health and their home. Today, to mark World Health Day, the World Health Organisation (WHO) is launching a campaign to raise awareness about depression. No doubt Jeremy Hunt will offer some platitudes in support of the WHO campaign but of course his words do not match his actions. Mental health services in the NHS continue to be chronically underfunded and people trying to access support are presented with a confusing and variable range of services that differ greatly depending on your location and diagnosis. Migrant and refugee communities often experience high rates of depression and other mental health issues like Post-Traumatic Stress Disorder (PTSD). Many of these communities already experience racial, ethnic and religious profiling within the NHS as a result of counter-extremism measures in mental health care. They will now be further excluded from accessing the help and support they need for fear of receiving bills they are unable to pay and fear of detention and deportation. It is the communities most marginalised by society and more likely to be in vulnerable situations, that are forced to shoulder the burden of austerity. Earlier in the year, in an attempt to shift the blame for the crippling impact of austerity, Jeremy Hunt announced a new legal duty for NHS Trusts to check patients’ eligibility for access to free healthcare upfront and demand payment before providing care. Although the government positions this as a cost-saving measure, the figures don’t add up. Even the Department of Health’s own estimate is that ‘deliberate health tourism’ costs only 0.3% of the NHS budget annually. Docs Not Cops are working with groups around the country to build a campaign of non-compliance with ID checks, and to encourage wards, GP surgeries and individuals to pledge never to ask for identification. The NHS was built on the principle that healthcare is a right not a privilege. Almost 70 years after its inception we are here to demand that this basic tenet remains.